Migratory birds—which must overcome so many natural challenges as they journey from one end of the globe to another—are having a much harder time overcoming the obstacles that humans have added to the mix: habitat loss, environmental contaminants, climate change, and a lot more. But we humans can be helpful, too. I saw vivid proof of that last January in the highlands of northern Nicaragua, where declining migrants such as Wood Thrushes spend the nonbreeding season. For years, this area has been a stronghold for farmers growing quality shade coffee. Not coincidentally, it’s also known as a paradise for birds. Everywhere we looked, we saw migrants: Philadelphia, Warbling, and Yellow-throated Vireos; Tennessee, Chestnut-sided, Wilson’s, and Yellow Warblers rolling through the understory in constant, flickering motion; Western Kingbirds and Western Wood-Pewees hawking insects in the treetops; Summer Tanagers and Rose-breasted Grosbeaks mixing with resident species like Black-headed Saltators and Clay-colored Robins. Flocks of Baltimore Orioles descended on blossoming trees and plucked the brilliant yellow flowers, dropping showers of blooms as they drank the rich pockets of nectar they’d revealed. Later, in the village of San Juan del Río Coco, I met with members of a cooperative of more than 400 small coffee producers who raise more than 2.5 million pounds of shade coffee every year. These producers raise coffee the way it’s been farmed for centuries there, below the canopy of intact, functioning forests that provide critical habitat for scores of migratory bird species. When these shade coffee farmers prosper, the outlook for migratory birds gets brighter, too. Seen from space, though, the hills around San Juan del Río Coco are an island of fertile green surrounded by hundreds of square kilometers of land already converted to sun coffee, pasture, and grain fields. 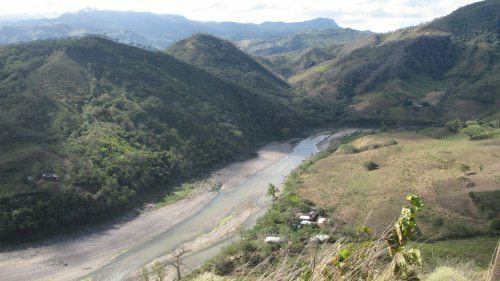 The fertile hills around Nicaragua’s San Juan del Río Coco are surrounded by denuded landscapes like this one—former forests converted to sun coffee, pasture, and grain fields. Photo by Scott Weidensaul. 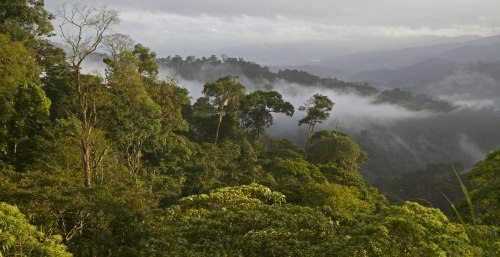 Increasingly, small shade coffee farms have been destroyed to make way for sun-tolerant coffee—an industrialized, chemical-dependent system that renders what had been prime bird habitat into the ecological equivalent of a parking lot. By some estimates, more than 40 percent of the shade coffee farms in Latin America have already been lost to satiate the demand for cheap coffee. Americans drink one-third of the world’s supply of coffee and are the driving force behind the shift from traditional, shade-grown coffee to habitat-destroying sun coffee. The decisions we make at the supermarket or specialty shop have profound effects on birds. Sun coffee may be cheaper to purchase, but in truth, there is no such thing as “cheap coffee.” Throughout the tropics, inexpensive sun-grown varieties exact an enormous toll on biodiversity, not to mention rural families and small cooperatives steamrollered by large agribusinesses. Fortunately, there is a surprisingly easy solution: Drink the right coffee. Scientists at the Smithsonian Migratory Bird Center (SMBC) created the Bird Friendly program to certify the very highest-quality shade coffee farms—the ones that provide the greatest benefit to migratory birds. By certifying this exceptional coffee, the SMBC program elevates its grade, so it then commands a premium price in the marketplace. This increased value creates a powerful incentive for farmers to keep shade coffee farms intact. While there are other shade certification programs, Bird Friendly is widely regarded as the gold standard. It requires USDA organic certification, and to qualify, farmers must meet a rigorous list of requirements, from canopy height and native tree diversity to pollution controls when the coffee is milled. The result? Coffee that safeguards habitat for the birds we care about, while providing an opportunity for farmers to receive a higher price for their crop—and which, because it ripens slowly in the shade, tastes far richer and more complex in your cup. That’s the way it happens in the shade forest oasis that surrounds the Nicaraguan village of San Juan del Río Coco. Please, do what you can protect this oasis and many more like it—for the bugs, fruit, and nectar these healthy forests still produce, and for the way of life that supports both rural families and migratory birds. All you have to do is choose Bird Friendly coffee. It may be the easiest and tastiest way to help migratory birds.